NOS Loaded Cherry is one of NOS Energy Drink's most popular flavors. NOS has recently lowered the caffeine content of their Energy Drinks from 260mg to 160mg. Loaded Cherry and Charged Citrus may still have 260mg/ can, while old product stock remains. Check the label to be sure which version you have. Both Loaded Cherry and Charged Citrus should be consumed with caution if consuming the old version..
See our complete NOS Energy Drink listing here. Carbonated Water, High Fructose Corn Syrup, Citric Acid, Sodium Citrate, Taurine, Natural Flavor, Caffeine, Sodium Hexametaphosphate (Preservative), Monopotassium Phosphate, Caramel Color, L-Theanine, Sodium Benzoate (Preservative), Potassium Sorbate (Preservative), Calcium Disodium Salt of EDTA (Protects Freshness), Sucralose, Red 40, Pyridoxine Hydrochloride (Vitamin B6), Cyanocobalamin (Vitamin B12). 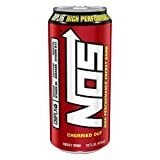 How Does NOS Loaded Cherry Compare? NOS Loaded Cherry contains 10.00 mgs of caffeine per fluid ounce (33.81mg/100 ml).